Lumi LED Lights SA, launched in 2010, is the brainchild of 2 online guru’s who are intent on energy conservation and our surrounding environment. Lumi’s products form part of the new generation of lighting which are 90% more efficient and save on your Eskom electricity bill and have a lifespan between 35,000hrs to 80,000hrs as opposed to your average 2,000hrs to 4,000hr life span. LED lights are also more damage resistant and emit very little heat adding to the safety element. Lumi has a wide variety of products for commercial, residential and industrial use. It’s ever expanding product list of indoor, outdoor and architectural lighting options on colour selection, colour changing bulbs/ strips, dimmable switches, strip lighting, lighting for signage, remote control or wall mounted switches and street lights already available. Lumi Lights products can be used for industrial lighting, commercial lighting or home lighting. 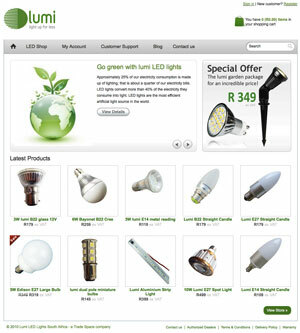 Online support is readily available for all your technical queries and shipping within South Africa is within 2 days when purchased on www.led-lights.co.za. Thanks for the awesome led’s!